But as Frederick R. Barnard said in 1921, a picture paints a thousand words… the pictures in this case being the ones I took this morning at St Peters train station. This entry was posted in Blog and tagged Australia, graffiti, my life, Street Art, Sydney, tagging. The graffiti-street art argument is polarising. Part of the everyday of elladee_images is street art, so I’m weighing in on the debate. Talented graffitists & street artists add colour & culture to the streets but vandals, no. Unfortunately many can’t or don’t want to accept there is a difference. 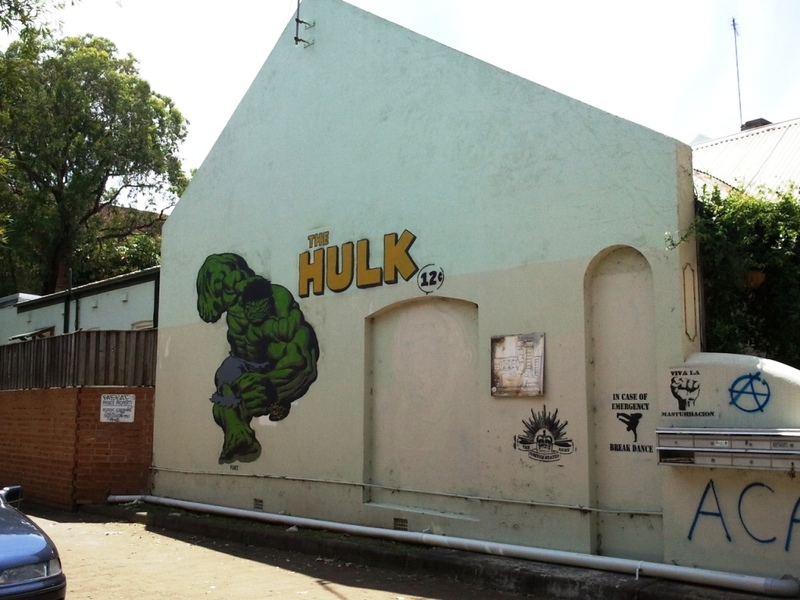 The Hulk “somebody who could change from a normal man into a monster” (Wiki) is personification of the graffiti-street art issue. “Rather than being soft or hard, light or heavy after the event, we need to be smarter in dealing with the causes and effects. People who are (understandably) offended by graffiti or whose property is damaged by it should still not expect their feelings to dictate the way the offenders are dealt with. The world and its inhabitants are more complicated than that, as the criminal justice system recognises… Prevention is best. Keep the possible offenders lawfully occupied and protect the property – by lights, barriers, CCTV, police and security patrols, surface coatings – whatever it takes. And promptly remove graffiti when it happens – by using offenders, if that can be arranged.” Nicholas Cowdery, former NSW director of public prosecutions. “What seems to get up the noses of some of the city fathers is that street art has not gone through the exhaustive process of climbing up and down the bureaucracy for sign-off at every level. It has not been authorised and possibly sanitised. But we need to remember that mostly it is ephemeral and self-regulated for quality by the local street artist communities… It is interesting that the state’s nannies are usually much more protective of our collective sensibilities than the community itself… Graphic marking of ceremonial sites is part of many ancient cultures, including our own indigenous rock art… Street art is a great Australian democratic tradition and we should be encouraging and supporting the best it has to offer.” Tamara Winikoff, executive director of the National Association for the Visual Arts. “With two-thirds of offenders aged under 18, there is a clear need for better parental supervision. Most graffiti attacks occur at night, often by children as young as 13 or 14 who should be at home rather than roaming the streets… Many offenders seem to view graffiti as a victimless crime, but it’s really a crime against the whole community. Our legal system needs to better reflect this in the way offenders are punished.” Ian Cross, mayor of Ku-ring-gai Council. ” My first exposure to graffiti vandalism came in September 2005 and involved three adolescents who entered our property. The whole episode was captured on a newly installed CCTV system, but police told us no arrests could be made as we had not displayed a sign warning that ”Video surveillance is operating on the premises”. Three days later, we installed numerous warning signs… Ultimately I had to repaint and sign-write two trucks, which cost my business about $30,000 in downtime, lost productivity and other direct costs. The most recent incident, last November, affected the exterior walls of our premises… But it doesn’t matter whether we threaten to send them to prison or to confiscate their cars. I believe the best deterrent is to make sure they can be tracked, identified and prosecuted. In the same way that victim impact statements are read before a criminal, graffiti vandals might change their ways if they could be made to understand how much damage they do. One way to do this is to make them clean up their mess.” Thomas Cann, owner of Baulkham Hills Landscape Supplies. 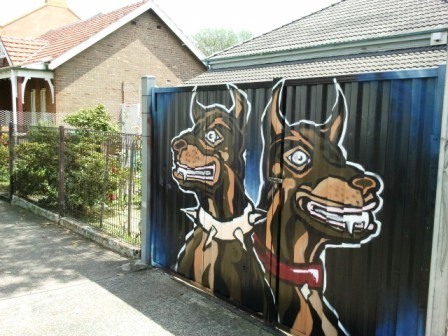 This entry was posted in Blog and tagged Australia, graffiti, opinion, Street Art, Sydney.